You will need to submit the completed registration form and a check for the registration fee made out to Immanuel Lutheran Preschool. We will also need to see the child's original birth certificate. The Mission of Immanuel Lutheran Preschool, an outreach of Immanuel Lutheran Church, is to share the love of Christ with children, parents, and one another, and to support the spiritual, emotional, social, cognitive, and physical development of the children entrusted to our care. 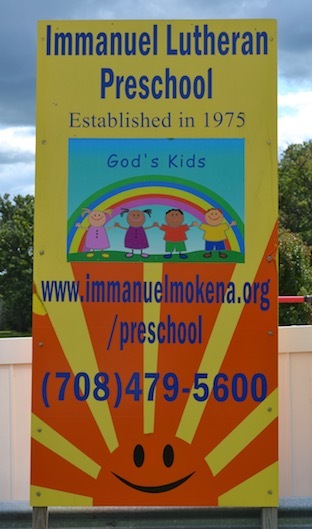 Immanuel Lutheran Preschool is licensed by the Department of Children and Family Services and the Will County Health Department and is a member of the Lutheran Schools Missouri Synod, Northern Illinois District. NEW THIS YEAR: An Early 3's class will be offered -- children must be 3 years old by December 31, 2019. Available Tuesday through Thursday mornings only. Afternoon classes will only be offered if a total of 10 children enroll per class. We offer classes for children 2 ½-5 years. They must be potty trained. All classes are offered morning and afternoon. Keep up with the latest activities by liking the preschool Facebook page!